Paul Baribeau is just downright heartbreaking. His unique voice, coupled with brilliant acoustic folk punk creates some of the most unique and disheartening music you'll ever hear. The songs themselves aren't very complicated: a few chords played on an acoustic guitar with short verses, catchy choruses, and relatively short length. Baribeau's soothing voice croons out heartbreak in the most pleasing and relatable way. The brutal honesty of the music is what makes Paul Baribeau's music so fascinating. If you've been through a tumultuous break up, you'll definitely be able to find something to relate to. Baribeau's realist lyrics shine on the most recent release, Unbearable. "Rolling Clouds" is the strongest track on the album, showcasing Baribeau's talent at mixing everyday experiences with ex-girlfriends and still managing to produce music that is anything but cliché. "How many horror movies have we sat through/how many Sour Patch Kids/ how many two liters of Mountain Dew?" brings the listener to not only to feel Baribeau's sadness, but to relive his experiences and cry along side him. The music is exactly what you would expect from a folk punk artist, but the simplicity only enhances the memorable tunes. The twangy acoustic guitars and subtly picked riffs act as the cold yet optimistic backdrop for the captivating music, and it will stick with you throughout your morning commute or while you're in bed staring at the ceiling late at night. 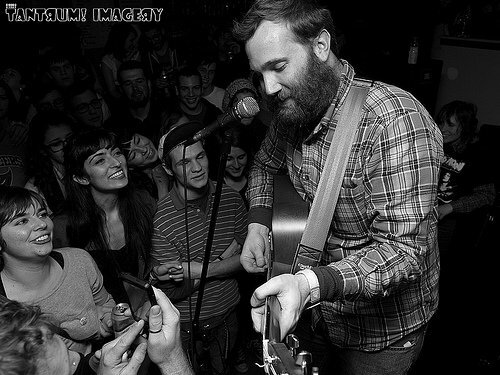 From just one listen, listers will be hooked with how catchy Paul Baribeau's songs are. Reeling fans in with an inviting guitar tone and mellow voice, Baribeau may be one of the best-kept secrets in the scene. Take a break from the mainstream, electro-pop saturated indie world and listen to the wisdom of Paul. You may just make him your new best friend. You can check out Paul Baribeau's discography on his Bandcamp here.